Have you seen Kiwi fruit growing over a sunny pergola whilst on holiday in Italy? Or bought them from the exotic fruit counter in a supermarket? Well how about growing your own right here in South East England? Many people have read that kiwi fruit are tricky to grow and needed warmth and a long summer to bear edible fruit. 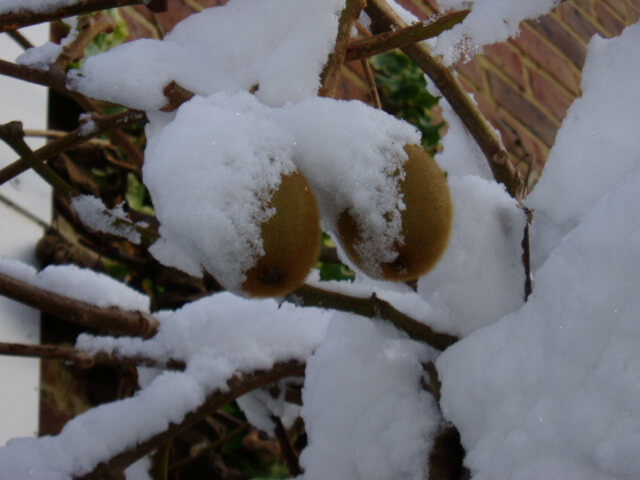 But I had a prolific kiwi plant alive and well in my garden in West Kent from which we picked ripe and sweet kiwis right through the snowiest weather and have a photo to prove it after a distinctly mediocr e summer. So how come? Well in reality Kiwi fruit, a native of South East Asia, is not as tender as first thought. They are rambling climbers that need support of a pergola or wall trellis and start fruiting when 5 years old – they will probably be a couple of years old when you buy them. Many varieties have male and female flowers on separate plants so you need one of each: Hayward is the most widely grown female variety and Tomuri a good male. More recently self-fertile varieties have become available and I have replaced my originals (lost to building work) with ‘Solo’ and hope to get fruit for the first time this year Leaves are huge and growth can be vigorous so they need plenty of organic matter. Fruits are borne on stems that grew the previous year so some care is needed in pruning once they fill the available space.